AT THE APHA WORLD CHAMPIONSHIP SHOW? Subscribe your stallion to the Breeders’ Trust by JANUARY 31 of the breeding year to subscribe at the lowest rate and receive a percentage of the Breeders’ Trust earnings of the nominated offspring. This subscription makes his foals eligible for nomination to both programs. Stallions may be nominated through December 31 of the breeding year, but additional fees apply. #1 Breed to a Breeders’ Trust subscribed stallion. #2 Nominate mare to the Breeders’ Futurity by DECEMBER 31 of the breeding year to take advantage of the lowest rates. Nominations may be made later, but additional fees apply. #1 Nominate foal to the Breeders’ Trust at the time of registration. The nomination fee is $100 if submitted by December 31 of the foaling year and increases thereafter. #2 Make the appropriate Futurity payments the year(s) you wish to show. 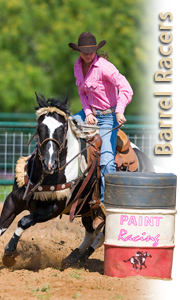 Breeders’ Futurity classes offered are 4-Year-Old Barrel Racing and 5-Year-Old Barrel Racing. Furthermore, any points accumulated in Open and Amateur competition at an APHA-approved show in any year will count toward annual Breeders’ Trust payouts for the horse’s entire show career!